Corrosion under insulation (CUI) of steel operating equipment and piping is recognized as an important problem in the ammonia refrigeration, chilled water, chemical, and petroleum industries. Insulation is a necessary component designed to save energy, control process temperatures, and protect workers from high wall temperatures. The environment under insulation—the CUI environment—can be hot and wet, which promotes aggressive corrosion. The American Petroleum Institute has directives that address the CUI problem and detail a program of identification, maintenance, and remediation. These directives, as well as efforts by professional societies (NACE International and ASTM), promote the development of new solutions. The issue in achieving a good end result is that no clear solution exists for newly installed piping, or with maintenance and remediation of existing installations. NACE Standard RP0198-98 (The Control of Corrosion Under Thermal Insulation and Fireproofing Materials—A Systems Approach)1 is an excellent source of information for preventing CUI, but many corrosion engineers would agree that electrolytes will eventually find their way into even the best system. Selecting the right coating is extremely important, as the coating is the last line of defense for keeping the electrolyte from the metal surface and preventing corrosion. For newly installed piping, CUI has frequently been addressed by the use of high quality protective paint coatings or thermal spray aluminum (TSA). However, this solution can be expensive for use in remediation. The surface preparation for the application of most epoxy or metal filled paints can be extensive; some require grit blast to white metal. In some cases the best alternative for remediation is to replace the entire section with new pipe. There are many excellent types of coatings available, but this article will focus on a hydrophobic anti-corrosion gel. It tolerates less-than-optimal surface preparation, is designed to keep the electrolyte away from the surface of the substrate, and also has the ability to neutralize the electrolyte if it breaches the vapor barrier and insulation. This coating can be applied beneath most insulation products and is installed by insulation contractors. The reactive anti-corrosion gel uses mineralization technology. Mineralization is the ability to grow very thin minerals on metal surfaces for useful purposes. The minerals are formed when reactants are delivered to the surface of the substrate (see Figure 1). 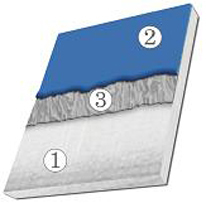 When the ferrous (steel) surface (1) is covered with a layer of reactive gel (2), the metal surface reacts with components in the gel to form a mineral layer (3). This thin, glasslike layer (3) acts as a barrier between chlorides and the metal surface, thus providing corrosion resistance. The mineral layer (3) has a thickness of 50 to 200 angstroms, only 0.01 percent as thick as a piece of paper. Although the thin mineral layer can be damaged by mechanical abuse, there is extra protection built into the system. The presence and uniqueness of the mineralized layer can be confirmed by conventional analytical surface methods such as x-ray photoelectron spectroscopy (XPS) or atomic force microscope (AFM) (see Figures 2 and 3). Barrier system: The specially formulated products have great adhesion characteristics and are hydrophobic to keep moisture away from the substrate. Buffering system: If moisture migrates through the gel, it is buffered to a high pH, which protects steel piping. Mineralization: The engineered surface resists corrosion even if moisture gets to it. The anti-corrosion gel has a maximum service temperature of 350°F (177°C). The mineralization technology in the anti-corrosion gel has a history of solving unique corrosion problems. The first application of the mineralization technology was by a major automotive supplier in a crevice corrosion application on the strand of brake cables. The strand-in-sleeve design of the brake cable, combined with the cyclical environment of heat and moisture, creates a severe crevice corrosion environment. The technology has been used for more than 30 years in this application, increasing service life and providing greater reliability. The first non-automotive industrial application was with the U.S. Navy. Following successful laboratory, pier-side, and shipboard demonstrations of the effectiveness of the gel in preventing crevice corrosion in anchor chain detachable link cavities, the Navy in 1999 changed the Planned Maintenance System (PMS) to specify the use of a mineralizing gel as the replacement for white lead and tallow in all surface ship anchor chain detachable links. Also in 1999, following extensive testing, the Navy issued Machinery Alteration (MACHALT) 526, which changed the design of the internals of weather deck watertight and airtight door dogging mechanisms. The basis for the change was the use of a mineralizing lubricant inside the spindle sleeve in the door frame to stop the corrosion that had been the cause of dogging mechanism failure. The watertight door-dogging mechanism corrosion problem was one of the top maintenance issues for the fleet.2 In May 2002, a second MACHALT—544—was approved to apply the same technology to ballistic-type dogs in three watertight doors in DDG-51 Class ships. These solutions represented a significant savings for the fleet. The gel has years of history on CUI applications in the food and beverage industry. It has also been used as flange filler and as an anti-corrosion coating in well head casings and on pig doors, structural steel, tank chimes, ammonia systems, and vessels. Field trials are currently underway to further evaluate this technology in areas where it is cost prohibitive to achieve optimal surface preparation. Aerated Salt Bath. A test was conducted by DeNOVUS in Moberly, Missouri, to determine the ability of the anti-corrosion gel to protect pipes in an aerated bath of 5 percent salt solution. Fifteen black iron pipes were used to measure the effectiveness of the gel in conditions similar to CUI. Fourteen pipes were coated with the gel, 7 were glass-bead-blasted prior to the application, 7 were left as-received with mil-scale, and 1 was left uncoated to act as a control. All the iron pipes were covered with fiberglass insulation and partially submerged in the 5 percent salt solution aerated bath. One glass bead-blasted and a non-bead-blasted sample were pulled at 7-, 31-, 80-, and 138-day intervals and then at a 1-year interval. 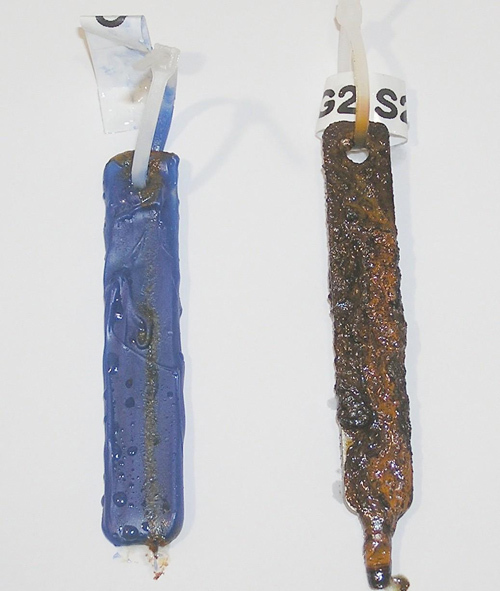 The results of tests show a very distinct line separating the sections of the iron pipes treated with the anti-corrosion gel and the sections left untreated. The untreated pipe sections had significant corrosion at 7, 31, 80, and 138 days, as well as at 1 year. There was no sign of corrosion on the coated sections of the pipes. 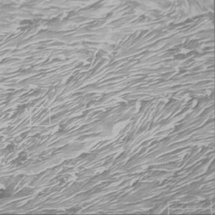 Performance of the gel was good even with minimal surface preparation prior to the application. 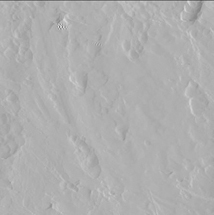 Isothermal. 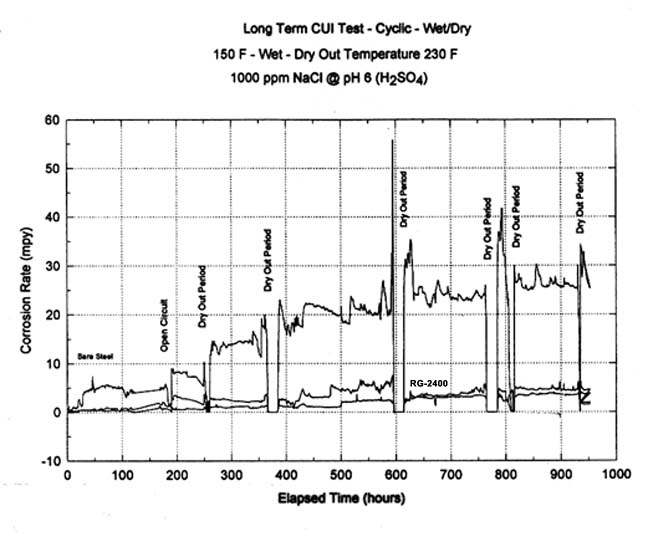 An isothermal laboratory test was conducted by CLI International, Inc., in Houston, Texas: a simulated CUI cell under isothermal and wet/dry cycling test conditions.3 The isothermal tests included maintaining the temperature at the ring surfaces at 150°F (65.5°C) continuously. The wet/dry tests included two cycles of maintaining temperature at 150°F (65.5°C) (wet) for 20 hours and then at 250°F (121°C) (dry) for 4 hours. The samples were evaluated using electrochemical polarization resistance data per ASTM G59 and mass loss (ML) data per ASTM G1. Test results revealed that the anti-corrosion gel reduced the corrosion rate by a factor of 10 (see Figure 4) and was effective in four practical applications: on bare steel at isothermal (150°F), on pre-corroded steel at isothermal (150°F), on bare steel in wet/dry environment (150/250°F cyclic), and on pre-corroded steel in wet/dry environment (150/250°F). Weight Loss. 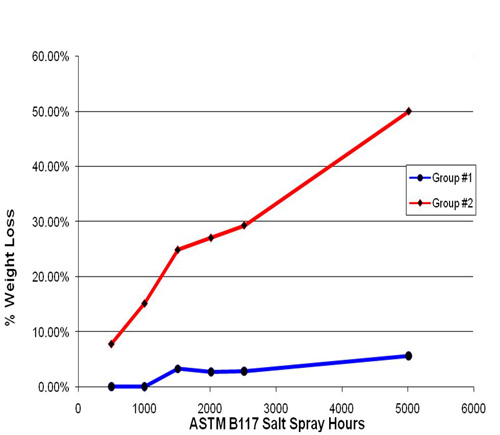 ASTM B117 salt spray protocol was used to evaluate anti-corrosion performance. The protocol simulates a severe corrosion environment using saltwater spray. The control coupons (bare steel) were tested alongside the coated samples to ensure a predictable corrosion rate. A total of 10 samples (1/2 in. x 3 in. x 0.062 in. 1020 steel coupons) were used for the test. The coupons were weighed prior to being coated or being placed in the ASTM B117 cabinet. Five coupons were coated with approximately 20 mils (1 mil = 0.001 inch) of gel (Group 1) and five were left uncoated to be used as controls (Group 2). The coupons were placed in an ASTM B117 corrosion chamber. Each coating system was inspected and photographed at 504-hour (21-day) increments until 2,520 hours and then at 5,016 hours. One coupon from each group was removed at each 504-hour (21-day) increment until 2,520 hours and then at 5,016 hours. Group 1 was removed, the gel cleaned off with a citrus cleaner, and the corrosion removed by submerging the coupon in acid. After each sample from Group 2 was removed, the corrosion was removed by submerging the coupon in acid. Each coupon was weighed after the corrosion was removed to determine weight loss (see Figures 5 and 6). The gel samples showed significantly less corrosion than the controls. 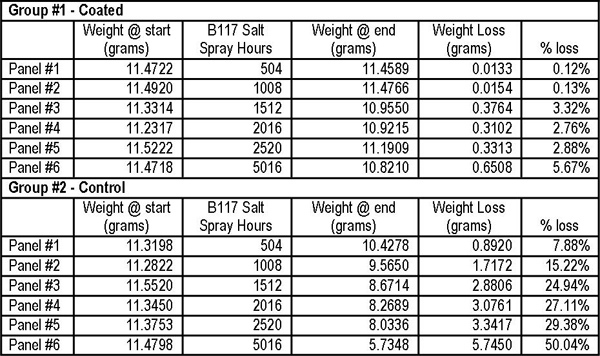 After 5,016 hours of exposure in ASTM B117 salt spray, the gel sample showed 5.67 percent weight loss versus 50.04 percent for the control sample. The gel was 90.2 percent more effective than the uncoated control after 2,520 hours and 88.66 percent more effective than the uncoated control after 5,016 hours of ASTM B117 testing. Much of the coated sample weight loss came from corrosion at the hole used to hang the coupons (see Figure 7). While this increased the corrosion rate, there was no other way to suspend the coupon without further damaging the coating. A 96-hour static acute toxicity screening test with the saltwater mysid (Mysidopsis bahia) was conducted on this technology by Wildlife International, Ltd., at its aquatic toxicology facility in Easton, Maryland (Project Number 486A-106). Groups of saltwater mysids (less than 24 hours old) were exposed to three concentrations of the test substance, a negative (dilution water) control, and a solvent control for 96 hours under static test conditions. One replicate test chamber was maintained in each treatment and control group, with 10 mysids in each test chamber for a total of 10 mysids per test concentration. Test chambers were 2 L glass beakers containing 1,000 ml of test solution. Nominal test concentrations were negative control, solvent control, and 1.0, 10, and 100 mg of the anti-corrosion gel. The solvent control and the 1.0, 10, and 100 mg anti-corrosion gel/L test solutions were prepared by adding the appropriate amounts of test substance along with 0.50 ml of dimethylformamide (DMF) to 1,000 ml of filtered saltwater. Test solutions were stirred vigorously approximately 30 minutes each using Teflon-coated magnetic stir bars and stir plates. Once mixing was complete, mysids were added to the test chambers. The solvent concentration in all the treatment groups and the solvent control was 0.50 ml/L. All control test solutions appeared clear and colorless. Test solutions (1.0, 10, and 100 mg anti-corrosion gel) appeared clear and colorless, with particles of test substance on the surface and sides of the test chambers increasing in intensity with increasing concentration. Cool-white fluorescent light tubes were used to illuminate the test and were controlled with an automatic timer to provide a photoperiod of 16 hours of light and 8 hours of darkness. Light intensity at test initiation was 285 lux at the surface of the water. The target test temperature was 25 ±1ºC. Test temperature, dissolved oxygen, and pH were measured in each test chamber at the test’s beginning and end. Observations of mortality and clinical signs of toxicity were made at approximately 3, 24, 48, 72, and 96 hours. Mortality data at 24, 48, 72, and 96 hours were used to estimate or calculate EC50 (the concentration that gives a response halfway between the baseline and maximum response) values. When possible, the EC50 values were calculated using the computer program of C.E. Stephan. The no-observed-effect concentration (NOEC) was determined by visual interpretation of the mortality and clinical observation data. Measurements of temperature ranged between 24.1ºC and 25.2ºC throughout the test. Dissolved oxygen concentrations remained >5.4 mg/L (74 percent of saturation) and pH was 8.1 in all treatments and the control groups at the beginning and end of the test. At test initiation, the dilution water salinity was 20 parts per thousand. The anti-corrosion gel is considered environmentally benign and is accepted by industrial hygiene departments in the food and beverage, oil and gas, and chemical industries. Many coatings require extensive surface preparation for optimal performance. The anti-corrosion gel can be applied on new piping or pre-corroded surfaces with a minimum surface preparation of Steel Structures Painting Council (SSPC) SP-2.4 The anti-corrosion gel needs to “wet out” the substrate to react with the surface. This can be achieved on surfaces that have tight rust, as long as the loose scale is removed. Anti-corrosion gel can be glove, brush, or spray applied on in-service piping. Application methods have been developed for in-service temperatures as low as -20°F (-29°C) and as high as 350°F (177°C). It can be applied on in-service systems that are expensive to shut down during rehab. A key step in preventing CUI is selecting the proper coating. Options include epoxies, polyurethanes, coal tar, wax tapes, TSA, and anti-corrosion gels. Temperature, surface prep, type of insulation, ease of application, and environmental and performance needs should all be considered during the selection process. NACE RP0198-98, The Control of Corrosion Under Thermal Insulation and Fireproofing Materials—A Systems Approach (National Association of Corrosion Engineers, 1998). DeNOVUS Watertight Door Case Study—www.denovus.com/casestudies.html. N.G. McGowan and Dr. D. Abayarathna, “Innovative and Environmentally Benign Solutions for Corrosion Under Insulation (C.U.I.) for Steam and Process Piping,” CLI International, Inc., Test Report, March 2003.